BUENOS AIRES, Argentina (CNS) — Residents of Villa 21-24, a slum on the south side of the Argentine capital, hold fond memories of Pope Francis. As archbishop of Buenos Aires, Pope Francis paid frequent visits to the mostly Paraguayan immigration population, celebrated Mass every Dec. 8 for the feast of Our Lady of Caacupe — Paraguay’s patroness — and even joined them in the procession that followed through the alleyways of the “villa” — short for “villas de miseria,” or “misery villages,” as the shanties here are known. He also baptized and confirmed the children of the residents and made the “villas” a priority, an early example of the church serving the poor, of which he often speaks. Pope Francis is scheduled to arrive July 10 in Paraguay, the last leg of a three-country trip that includes Ecuador and Bolivia and takes him to some of the continent’s poorer and more peripheral places. It also takes him close to this his home of Argentina, which borders both Bolivia and Paraguay and has received influxes of immigrants, streaming south from those countries in search of improved economic opportunities or access to health care and education unavailable back home. Residents of Villa 21-24 plan on traveling 15 hours in caravans to see the pope in their country of origin. Thousands of Argentines are expected to do the same, as the pope brings his missionary message to his home continent — a place, he has said, urgently requiring re-evangelization. “When news emerged that the pope was going to Paraguay, inevitably, the idea also emerged that we would go as a parish,” said Father de Vedia, one of the 20 “curas villeros” (shanty priests) serving and living in the villas. “It wasn’t as if there was a decision made, it was as if we got swept up” by the enthusiasm, he added. The number of Argentines heading to Bolivia and Paraguay remains unknown. In Santa Cruz, Bolivia, where the pope is scheduled to arrive July 8 and celebrate Mass the following day, organizers expect 600,000 visitors from outlying areas and the north of Argentina. 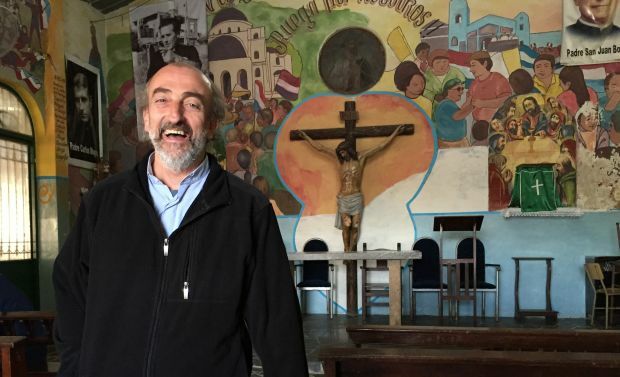 Bishop Jorge Lugones of Lomas de Zamora in suburban Buenos Aires said most of those going to see the pope will be immigrants or have ties to the two countries, mainly because Pope Francis is not expected to visit Argentina until next year. Observers say the pope did not want to visit Argentina until after October national elections. Organizers in Paraguay expect hundreds of thousands to attend a July 11 Mass at the Caacupe Marian shrine. Argentine President Cristina Fernandez de Kirchner, who has mended relations with Pope Francis, confirmed she would attend a July 12 Mass in the Paraguayan capital, Asuncion. Parishes in the Diocese of Formosa, which borders Paraguay, are organizing convoys, said Bishop Jose Conejero Gallego, who expressed worry the influx would create chaos in a country with inadequate infrastructure. Paraguay ranks among the poorest and most corrupt countries in South America, though a boom in agricultural exports has brought double-digit growth in the gross domestic product in recent years. Emigration continues, however. Priests serving the Paraguayan population in Argentina describe their flock as hard-working and devout and bringing unique Catholic customs to their congregations. “(The pope) knows the Paraguayans’ idiosyncrasies,” said Father Jose Maria di Paola, another shanty priest better known as “Padre Pepe,” who is accompanying a group of 100 parishioners to Paraguay. Those idiosyncrasies include popular piety, novenas and a ritual known as “agua de socorro,” which Father de Vedia describes as a sort of “emergency baptism” administered before the actual sacrament. The pope’s attention to the community has persisted, in spite of his leaving Argentina. Acuna recalls the pope sending a greeting to the Villa 21-24 parish May 15, Mother’s Day in Paraguay. All the mothers received a printed copy of the message.